The kidneys of vertebrates have the vital function of removing metabolic wastes from the blood and otherwise maintaining its normal composition. The two kidneys of a normal human adult produce 1 to 2 liters (about 30 to 70 fluid ounces) of urine each day that contain wastes, excess water, and other unneeded molecules. Production of less than 0.4 liter (13.5 fluid ounces) of urine per day is insufficient to eliminate wastes and regulate the composition of blood. Such a condition is always fatal within a few weeks unless the underlying cause is corrected, a new kidney is transplanted, or the blood is artificially cleared by dialysis . The human kidney belongs to one of three kinds of kidneys that occur among different vertebrates at various developmental stages. The first type, called the pronephros, lies toward the front of some fishes and the embryos of many vertebrates. The mesonephros lies more posteriorly and occurs in most adult fishes and amphibians and in the embryo of humans and other mammals. The metanephros occurs still farther posteriorly and is the type of kidney in adult reptiles, birds, and mammals, including humans. Location and gross anatomy of the human kidneys. Blood enters the kidney via the renal artery, and almost all of it leaves the kidney through the renal vein. The kidney removes excess ions, water, and other molecules, which are excreted through the ureters as urine. time about one-fifth of the body's blood is flowing through the kidneys. The blood enters each kidney from the body's major artery, the aorta, by means of the renal artery. (The word "renal" refers to kidney.) 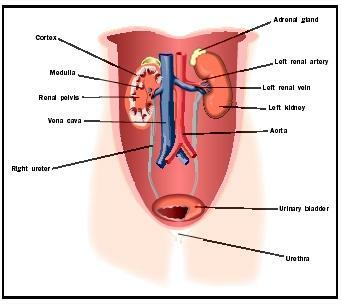 Blood leaving the kidney enters the major vein, the vena cava, via the renal vein. Also connecting to the kidney is a third tube, the ureter, which conducts urine to the urinary bladder for temporary storage. From this "plumbing diagram" one can get an overview of renal function: blood enters the kidney, wastes and excess molecules are removed with the urine, and the blood is returned to the circulatory system. To appreciate how the kidneys function, however, one must take a microscopic view of one of the million or so structures called nephrons within each kidney. Each nephron begins its work by producing a filtrate of blood. Filtration occurs in a tuft of capillaries called the glomerulus. The lining of the glomerulus is leaky enough to allow blood pressure to force water, ions , and small molecules out while retaining cells and very large molecules in the blood. The filtrate, which is very much like the fluid portion of blood (plasma), enters Bowman's capsule, which encloses the glomerulus like a helmet. Bowman's capsule conducts the filtrate into the first part of the nephron tubule, called the proximal convoluted tubule. In humans approximately 180 liters of filtrate (almost enough to fill a 50-gallon drum) make it this far each day. Fortunately, not all of it goes into urine. In the proximal tubule, many of the inorganic ions and almost all of the glucose and amino acids get pumped out of the filtrate and go back into the blood. Most of the water in the filtrate is also drawn back into the blood. The tubular fluid next passes through a hairpin turn called the loop of Henle, which helps the nephron return more water to the bloodstream rather than allowing it to be lost in the urine. How this works will be explained later. Tubular fluid then enters the distal convoluted tubule of the nephron. Here further transport of particular ions may occur, depending on whether the concentration of that ion in the blood is too high or too low. For example, if the pH of the blood is too low, hydrogen ions (H + ) are transported out of the blood and into the tubular fluid. If the pH is too high, H + ions are transported from the fluid into the blood. By the time the fluid has completed its journey through the distal convoluted tubule, it is essentially dilute urine, called preurine. Preurine from several nephrons enters a tube called the collecting duct. As preurine passes through the collecting duct, more water can be removed and returned to the blood. Water is drawn out of the collecting duct by osmosis due to an increasing concentration of ions surrounding the collecting duct. The loops of Henle produce this concentration gradient by a combination of transport and diffusion of ions and urea. Urea is a molecule that temporarily stores the nitrogen produced by the metabolism of proteins . After helping to create the concentration gradient, urea is eventually eliminated with the urine. Saladin, Kenneth S. "The Urinary System." In Anatomy and Physiology, 2nd ed. Dubuque, IA: McGraw-Hill Higher Education, 2001. Supplemental Image Database, The Kidney. <http://www.kumc.edu/instruction/medicine/pathology/ed/ch_16/mainframe.html> . Alcohol suppresses antidiuretic hormone (ADH), which normally reabsorbs water in the kidneys, and so increases urine volume.